Hello friends, welcome to Amazing Adviser. Today I am going to discuss India’s Top 10 companies as per their market capitalization. They are important to know because of two reasons. Firstly we are Indians and we should know our finest company’s names. Secondly, they are the most liquid stocks from the trader’s point of view. So let’s start the countdown. This company was founded in 1985 by Mr. Uday Kotak and finally received a banking license from Reserve Bank of India in February 2003. First, its name was Kotak Mahindra Finance Limited and after approval of RBI, it became the first non-baking finance company in India to be converted into a bank. It is the second largest private bank in India by market capitalization. It has total 33,013 employees and generated $2.9 billion revenue in 2017. ICICI Bank is one of the Big Four Banks of India and has 4867 branches and 14,417 ATMs across India. It has a presence in 19 countries including India. It offers a wide range of banking products and financial services including Investment Banking, Insurance and Asset Management. It was founded in 1955. With more than 81,548 employees this company generated revenue of $17 billion in 2017. SBI is the largest PSU bank in India and the market leader in PSU banking sector. That’s the reason that it is such a huge company and considered to be bluechip. This company ranks on 216th on the Fortune Global 500 list of World’s Biggest Corporations as of 2017. This was founded on 2nd June 1806. Currently, this company has more than 278,000 employees and generated a revenue off $29 Billion. Infosys is the second largest Indian IT company by 2017 revenues and 596th Largest Public Company in the world in terms of revenue. This company was established by 7 engineers in Pune, India with an initial capital of $250. It was registered as Infosys Consultants Private Limited on 2nd July 1981. This company has a total number of 200,364 employees and generated a revenue of $10.93 billion in 2017. HDFC is a major provider of finance for housing in India. It was founded in 1977 as a mortgage company. Mr. Hasmukhbhai Parekh had played a major role in establishing this company. In 2000 HDFC joined the asset management industry and in the same year, it got approval from IRDA for insurance business. It has 2081 employees as per sources and generated revenue of $4.63 billion in 2016. In 2013 it has won “India’s Best Board”. ITC is an Indian company headquartered in Kolkata, West Bengal. This company is a big player in cigarette manufacturing and earns 80% of total revenue by cigarette business though it employed 80% of total capital in non-tobacco businesses. It was established in 1910 and named as “Imperial Tobacco Company of India Limited”. This company had completed its 100 years in 2010 and earned $8.4 billion revenue in 2017. It has 26,159 employees at more than 60 locations across India. HUL was established in 1933 and named as Lever Brothers and later changed its name to Hindustan Unilever Limited. It is the market leader in the consumer goods industry. It ranked number one on Forbes’s List of “Most Innovative Companies” across the globe for 2014. It has more than 18,000 employees and generated revenue of $4.8 billion in 2017. HDFC Bank is India’s largest private sector bank and had more than 88,000 employees as on 31st March 2018. It had won 69th rank in BrandZ “Top 100 Most Valuable Global Brands”. In 1994 it was incorporated and headquartered in Mumbai. It had shown exceptional performance compared to peers in 2017 by installing 4.3 lacs POS terminals. It had also issued 235.7 lacs debit cards and 85.4 credit card in FY 2017. It had generated $11 billion revenue in 2017. TCS is coming at second in our list. This is an Indian Multinational Company providing IT services and Consulting. 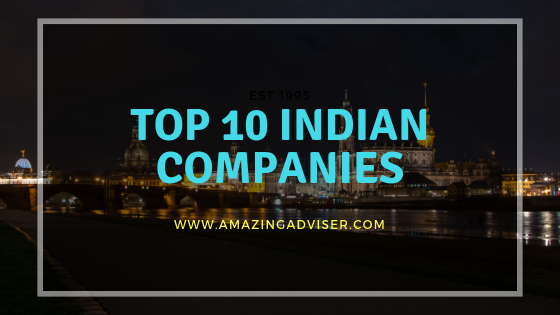 This company is a part of the TATA group and operating in 46 countries.TCS is one of the most valuable companies in the world and ranked 64th in the Forbes “World’s Most Innovative Companies”. It is the world’s second largest IT services provider. TCS became the first Indian company to breach $100 billion market capitalization. It has more than 400000 employees and generated $19.08 billion revenue in 2018. Finally, Reliance has secured the first position in our India's Top 10 Companies list. This company was co-founded by Dhirubhai Ambani and Champaklal Damani in 1960. In 1965 the partnership ended and Dhirubhai Ambani became its sole owner. Reliance is ranked 203rd on the Fortune Global 500 list of “World’s Biggest Corporations” as of 2017. It is also ranked 8th among Top 50 Global Energy Companies by Platts as of 2016. It has more than 187,000 employees and generated revenue of $60 billion in 2018. So friends if you liked this article then leave a comment. Have a nice day and happy investing.